Good grinds, great finds, and Hawai'i ’s liveliest minds are brimming between the covers of a released book. Look for a friend, family member, or neighborhood favorite in a new book highlighting the small family businesses and extraordinary individuals of Hawai'i . 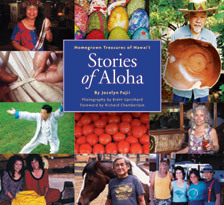 Local author Jocelyn Fujii and photographer Brett Uprichard released Stories of Aloha: Homegrown Treasures of Hawai'i in October 2009. The book is a compilation, with updates, of 140 articles culled from the hundreds of articles she wrote for Spirit of Aloha, the inflight magazine of Aloha Airlines, before the airline shut its doors in 2008. Local farmers, artists, designers, bakers, chefs, entrepreneurs, and purveyors of Island delights are featured in the book. The 264-page softcover also features extraordinary individuals leading ordinary lives, who inspire readers and perpetuate Hawai'i ’s best qualities. Meet Pono the Poi Dog, an unlikely new superhero, in Pono, the Dog that Dreams, written by Jocelyn Fujii and illustrated by Hawai'i artist Donna Burns. Based on a real-life poi dog named Pono, this children’s book chronicles the tales and adventures of a lovable puppy that rises from abandonment into a canine force with special friends and powers. The real-life Pono was rescued from a Maui shelter by Honolulu dog lover Larraine Koike, founder of Pono the Poi Dog Productions. Koike’s company brought “Dog Whisperer” Cesar Millan to Honolulu for sold-out appearances in 2005 and 2006. 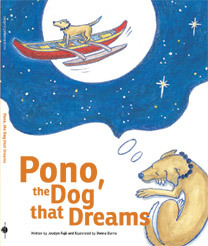 Since those events, Koike has nurtured the idea of a children’s book series based on a dog named after pono, the Hawaiian word for righteous and correct. Pono is a German shepherd/border collie mix that grows from a modest, unremarkable puppy into a courageous superhero who strives to live up to his name. Characters such as a mo’o, a water spirit, and Nana, a wise Hawaiian elder, guide Pono through the labyrinths of life. The 40-page hardcover is a romp through island culture, spiced with layers of adventure, fantasy, and discovery. 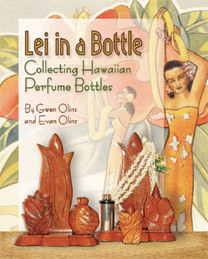 This authoritative book by esteemed Hawaiiana collectors Gwen and Evan Olins offers an unprecedented look, the Hawaiian perfume bottles of the 1930s to 1960s. The Olinses have the largest known collection of the carved-wood bottles and reveal it for the first time in Lei in a Bottle: Collecting Hawaiian Perfume Bottles. With its more than 250 images, this 84-page softcover offers a rare glimpse into the art and aesthetics of territorial Hawai'i, when visitors to Hawai'i traveled here by cruise line and fell under the spell of the lei, the Islands’ most prominent symbol of aloha. The Hawaiian perfume bottle emerged from the desire to take fragrant fresh lei to the mainland before jet travel made it possible. Today these carved wood bottles are among the finest examples of Hawai'i’s arts-and-crafts movement and eagerly sought by collectors. By unveiling their extensive collections, the authors reveal how the finest artistry of the time revolved around Hawai'i’s natural forms and fragrances. In Lei in a Bottle, Hawaiiana collectors will find a passionate account and helpful information on the ins and outs of collecting, while casual readers will be entertained and buoyed by the authors’ intimate, spirited writing style in recounting little-known facts and anecdotes of the time. For information: hulaheaven@aol.com; (808) 329-7885. One man’s powerful testament to the inexorable bond between a man and his dog, written passionately and poignantly in this 36-page children’s book. 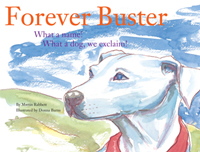 Watch Buster come alive in this delightfully illustrated book describing his life, passing, and ultimate immortality. As Rabbett makes clear in his enlightening and uplifting first book, even death cannot break the bonds between a dog and his beloved master. Author Martin Rabbett has performed, produced, and directed for network television, Broadway, and regional theater, including the Berkshire Theatre Festival. Donna Burns is an artist, designer and consultant who specializes in island apparel, interiors and home accessories.